Providing counsel to students, planning education, choosing proper schools for students, and helping with English language. Providing a place to study and dealing with application for every educational level both a public and a private sector. Dealing with visas and helping with visa application. Providing accommodation and airport pick up. Obtaining plane ticket at reasonable price for both students and parents. Providing orientation for students before travel. Providing modern library with full information and internet Wi-Fi. Providing Career Guidance to help with further education by recommending an appropriate career for each student’s education. Providing other projects from each country such as Work & Study in Canada or Summer Program in Australia, Canada, USA, UK and Singapore etc. Providing the project observe activities about education in oversea. 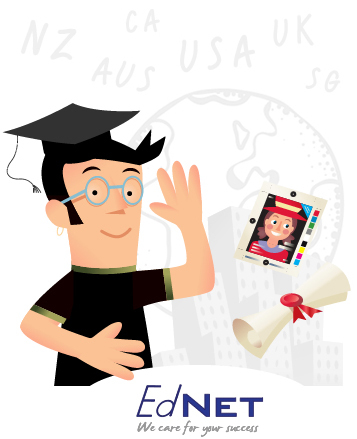 Recruitment IELTS exam Under the British Council network. Besides providing services for school application, EdNET also understand the significant of other projects that will increase quality and skill for students. Therefore, EdNET will be your companion who helps you through school educations or other projects that will improve students’ ability.